Starting a business with your friend? Not always a good idea. 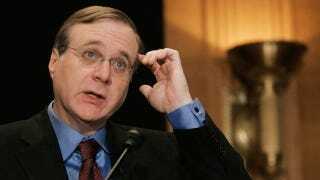 Just look at Paul Allen who co-founded Microsoft with childhood friend Bill Gates. Allen is now a billionaire beyond belief, owning sports teams and super yachts, but his new book is taking jabs at Bill Gates and makes it look like Allen was more important in Microsoft than he really was. In the book, Idea Man: A Memoir by the Co-founder of Microsoft, due out April 17th, Allen put himself in meetings that former Microsoft employees only remember Gates being at and claimed he was the sparkplug for a lot of the ideas at Microsoft, downplaying the role of Bill Gates. The WSJ says Allen sounds like a bitter man unhappy about receiving proper due for Microsoft. He's the 57th richest man in the world! "In that moment, something died for me. I'd thought that our partnership was based on fairness, but now I saw that Bill's self-interest overrode all other considerations. My partner was out to grab as much of the pie as possible and hold on to it, and that was something I could not accept."